Nero's Torches by Henryk Siemiradzki. According to Tacitus, Nero targeted Christians as those responsible for the fire. 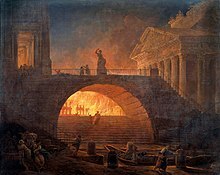 The Great Fire of Rome was an urban fire that occurred in July of the year 64 AD. The fire began in the merchant shops around Rome's chariot stadium, Circus Maximus, on the night of July 19. After six days the fire was brought under control, and before the damage could be measured, the fire reignited and burned for another three days. In the aftermath of the fire, two thirds of Rome had been destroyed. According to Tacitus and later Christian tradition, Emperor Nero blamed the devastation on the Christian community in the city, initiating the empire's first persecution against the Christians. However, some modern historians, including the Princeton classicist Brent Shaw, have cast doubt on the traditional view that Nero blamed the Christians for the fire. Nero was proclaimed emperor in 54 AD at the age of 16. His rule has commonly been associated with impulsiveness and tyranny. Early in his rule, he was heavily advised, but he slowly became more independent. In 59 AD, encouraged by his mistress Poppaea, Nero murdered his mother. His leading adviser, Seneca, was discharged and forced to commit suicide. After the Great Fire of Rome occurred in 64 AD, it was rumored that Nero ordered the fire in order to clear space for a new palace. Publius Cornelius Tacitus was a senator and historian of the Roman Empire. His exact birth date is unknown, but most sources place it in either 56 or 57 AD. His two main works, the Annals and the Histories, covered the history of the empire between 14 AD and 96 AD. However, much of the work has been lost, including the books covering events after 70 AD. He was only 8 years old at the time of the fire, but he was able to use public records and reports to write an accurate account. Fire in Rome by Robert, Hubert. A painting of the fire burning through Rome. According to Tacitus, Nero was away from Rome, in Antium, when the fire broke out. Nero returned to the city and took measures to bring in food supplies and open gardens and public buildings to accommodate refugees. Of Rome's 14 districts, 3 were completely devastated, 7 more were reduced to a few scorched and mangled ruins and only 4 completely escaped damage. The fire destroyed mostly everything it came in contact with due to poorly built and maintained timber-framed homes. The Temple of Jupiter Stator, the House of the Vestals, and Nero's palace, the Domus Transitoria were destroyed. Also destroyed in the fire was the portion of the Forum where the Roman senators lived and worked. However, the open mall in the middle of the Forum remained and became a commercial center. Nero didn't help the accusations of him starting the fire by quickly reconstructing the part of the city that had burned in the Greek style and beginning work on his new palace. The new palace, known as Golden House, would have been massive, covering a third of Rome. Nero sent men acting drunk to start the fires. Nero was motivated to destroy the city so he was able to bypass the senate and rebuild Rome in his image. Nero quite openly sent out men to set fire to the city. Nero watched from the Tower of Maecenas on the Esquiline Hill singing and playing the lyre. The fire was an accident that occurred while Nero was in Antium. Rumor had it that Nero had started the fire. Therefore, to blame someone else for it (and thus exonerate Nero from blame), the fire was said to have been caused by the already unpopular Christians. ^ Society, National Geographic (2014-06-18). "Great Fire of Rome". National Geographic Society. Retrieved 2019-04-07. ^ "The Great Fire of Rome | Background | Secrets of the Dead | PBS". Secrets of the Dead. 2014-05-29. Retrieved 2019-04-07. ^ Dando-Collins, Stephen (September 2010). The Great Fire of Rome. Da Capo Press. ISBN 978-0-306-81890-5. ^ Shaw, Brent (2015-08-14). "The Myth of the Neronian Persecution". The Journal of Roman Studies. 105: 73–100. doi:10.1017/S0075435815000982. ^ "Tacitus | Roman historian". Encyclopedia Britannica. Retrieved 2019-04-13. ^ Tacitus, Publius. The Annals. ^ "The Great Fire of Rome | Clues and Evidence | Secrets of the Dead | PBS". Secrets of the Dead. 2014-05-29. Retrieved 2019-04-07. ^ "Nero | Biography & Accomplishments". Encyclopedia Britannica. Retrieved 2019-04-07. ^ Suetonius. "Life of Nero". Lives of Twelve Caesars.